Wayne Wilkinson, chief financial officer and senior vice president of WBB, just celebrated his first year with the company. It’s been fast, fun and full of challenges, he told WashingtonExec in an interview earlier this month. WBB, a $100 million private-equity backed company providing life cycle management services to the federal government, has local offices in Washington, D.C., Reston, Va., and Quantico, Va. The company recently transitioned from an employee stock ownership plan (ESOP) to a private equity-backed business, Wilkinson added. Wilkinson spoke about his first year at WBB, and about his views on lowest-price, technically-acceptable (LPTA) approaches to business, expectations for the market in government contracting and how he’d advise a small business in an economic downturn. Wilkinson said he joined WBB at a good time because the company was under new ownership for approximately a year, with Lake Capital acquiring WBB in early 2012. Today, the company continues to integrate WBB’s legacy with the Net-Star 1 holdover and bring it all under WBB management, he said. “There are a lot of challenges in terms of culture, as well as transitioning the mind frame from an ESOP organization into an organization with external shareholders and directors,” Wilkinson said. The company has had to rebuild the business operations portion of the organization, Wilkinson said, favoring more experienced professionals that offer a big business mindframe as well as facing challenges due to the impact of sequestration and LPTA contracts, he added. Wilkinson said he’s not a big fan of LPTA contracts in today’s business environment. It hasn’t served the government to the full purpose it intended to, which is to try and enforce cost-control, he said. Early on, he added, the industry saw increased spending as a result of defense spending from the Reagan and Bush administration, then a transformation and cost control during the Clinton administration. That soon morphed into a post-9/11, Wilkinson said, where things went kind of crazy. In a nutshell, he said, things have come full circle from his early days in government contracting. A government contracting veteran with more than two decades of experience, Wilkinson’s expertise lies in strategic planning, corporate development and business operations. Trying to lay a roadmap strategy for growth has always been challenging, he said, discussing how the government contracting world has changed and what he sees for the future. “Considering the slow down and reduction in the market, the back half of this year and as we move into next year, we should start to see an increase in new business awards,” Wilkinson said, noting that the weather, along with sequestration, contributed to the slow down last year and carrying over into this year. Wilkinson said that having a core foundation is important for a small business looking to grow in an economic downturn. People tend to bite off more on the debt side as a smaller business, he noted, as opposed to looking at managing their cost like it is their own personal finances, which sometimes goes hand-in-hand. Previously, brighter, longer-term views were seen, Wilkinson said, as opposed to today where there’s a tendency to chase opportunities without any regard to what tomorrow will bring. Wilkinson said that several business and leadership books have helped him throughout his career. One he noted is The 7 Habits of Highly Effective People by Stephen Covey. It’s a book that’s been the foundation Wilkinson used in migrating from a staff member into senior management roles. “It’s still something I tend to go back and draw upon as a leader today,” he explained. Prior to his position at WBB, Wilkinson founded Nedac LLC to provide strategic advisory services to emerging and mid-size government contractors focused on business transformation. 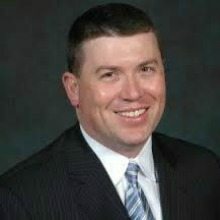 He previously served as director and president of Data Technologies & Analytics LLC, an Arlington Capital Partners’ portfolio company providing data analytics tools and solutions to the intelligence community. And he holds an undergraduate degree in accounting from Virginia Tech as well as an MBA from Marymount University. Wilkinson is also a history buff. He became interested in grade school when a teacher spoke about her grandfather’s experience in the Civil War. She shared artifacts and coupled that with lessons on the Civil War, he said.